Nigeria's President Muhammadu Buhari has repeatedly said that the Boko Haram jihadist group has been defeated but BBC analysis of its attacks shows little change. Research by BBC Monitoring shows the group killed more than 900 people in 2017, marginally more than it did in 2016. It consistently mounted attacks during the year, defying Mr Buhari's assertion that the militants had been routed. We have crunched the numbers to show in a series of graphs, the type of attacks Boko Haram stages, which areas they target and which month is most deadly. In August 2016, the group split into several factions after IS announced that Shekau had been replaced. 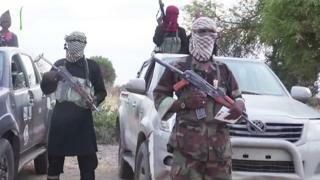 Boko Haram is one of the least understood jihadist groups in the world. To gain more insight into how it operates, BBC Monitoring tracked local and international media reporting of its attacks in 2016 and 2017, logging the specific details of each attack. The results of this research must be balanced with the limitations of covering jihadism in West Africa. Nigeria-focused journalist Andrew Walker told BBC Monitoring that the uneven nature of local media reporting and the roaming nature of the group mean that the full extent of attacks cannot be accounted for with great accuracy. But by tracking reporting from 48 different media sources in English, French, Arabic and the West African languages of Kanuri, Hausa and Zarma, this research gives an insight into the scale and geographical spread of Boko Haram's deadly operations. Boko Haram reportedly mounted a total of 150 attacks in 2017, an increase on the 127 attacks it is said to have mounted the previous year. In both years the group launched its highest number of attacks in January, with both these spikes followed by President Buhari's claims that Boko Haram had met its demise. The group's attack locations have broadly remained the same over the last two years. Nigeria suffered the majority of attacks in both 2016 and 2017, with Borno State - the birthplace of the insurgency - being the most common target. Boko Haram proved it could still strike further afield in 2017, with reported attacks in Cameroon's Far North region, Niger's Diffa region and Chad's Lac region, all of which border north-eastern Nigeria. This broadly mirrors where it chose to attack in 2016, but there are slight differences between the two years, with Nigeria experiencing more attacks in 2017 while Niger saw fewer. Boko Haram reportedly launched 90 armed assaults and 59 suicide attacks in 2017. Nigeria bore the brunt of these attacks, with the most common method being armed assault. Across the border in Cameroon the group appeared to follow a different strategy, mounting more suicide attacks than armed assaults. The same methods in these two countries were also seen in 2016. The data show a growing overall emphasis on suicide attacks. In Nigeria, the group increased its suicide attacks from 19 in 2016 to 38 in 2017, with Cameroon experiencing a similar increase. Suicide attacks were the most common method of attack in the Nigerian city of Maiduguri, which continues to be the epicentre of the insurgency, whereas armed assaults were more common elsewhere. At least 967 people were reportedly killed by Boko Haram attacks in 2017, an increase on the previous year when 910 deaths were reported. The highest concentration of fatalities in 2017 was in Maiduguri, which has seen its population double to two million in recent years as people flee Boko Haram violence in rural areas. Elsewhere in Nigeria, there were also high concentrations of fatalities in the localities of Magumeri, Konduga, Damaturu and Mubi. There have been no big changes in the group's targeting in the last two years, with Boko Haram attacking hard and soft targets. Its most common targets in 2016 and 2017 were villages and militaries. Boko Haram also continues to target mosques and internally displaced people (IDPs) fleeing the violence. The relationship between IS and Boko Haram is unclear. Only 13 of 151 reported Boko Haram attacks in 2017 were claimed by IS, suggesting operational links between the two groups are weak. This may be due to the military pressure placed on IS in Iraq and Syria, where the group lost its so-called caliphate in late 2017. The disparate nature of Boko Haram may also make it difficult for IS to issue claims as it cannot verify which faction is behind an attack. Why is Boko Haram so resilient? For years, critics have accused the Nigerian military of not properly equipping its soldiers to deal with Boko Haram. This may change in 2018, with the US agreeing to sell weapons to Nigeria. Until then, the group looks set to remain a significant threat, says BBC Africa Security Correspondent Tomi Oladipo. "Despite repeated claims by the Nigerian government about Boko Haram's demise, the group's different factions continue to threaten the stability of Nigeria's north-east and the wider Lake Chad Basin area," he said. According to Oladipo, Boko Haram has relied on stealth to keep its insurgency alive in the face of government offensives. "Over the years, the ability of the jihadists to blend into local communities, or to conceal themselves in the vast terrains of the region, has aided their campaign of violence," he said. 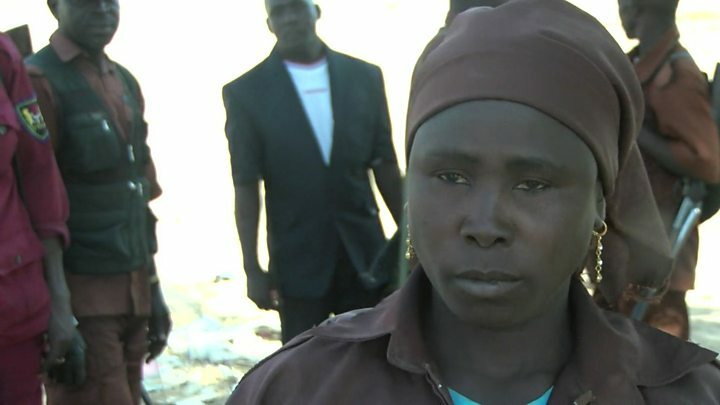 They fought Boko Haram - but what next?